Schaumburg /ˈʃɔːmbərɡ/ is a village located in Cook County in northeastern Illinois, United States. The village is a northwestern suburb of Chicago and is part of the Golden Corridor. Schaumburg is located roughly 28 miles (45 km) northwest of the Chicago Loop and approximately 10 miles (16 km) northwest of O'Hare International Airport. As of the 2010 census, the village had a total population of 74,227. The village contains the world headquarters of Motorola Solutions and one of only two IKEA stores in Illinois. It contains the Woodfield Mall, the 11th largest mall in The United States according to List of largest shopping malls in the United States, which at most times has over 300 stores. Schaumburg's transition from a rural community to that of a suburban metropolis began with Alfred Campanelli's first large scale suburban-style development in 1959 and Woodfield Mall's opening on September 9, 1971. Schaumburg has many companies and jobs in the area. It also has plenty of shopping and is convenient to main highways and roads. There are many parks and recreation activities for children and adults. Schaumburg real estate includes condos priced from as low as 100k to Luxury homes. Schaumburg was mostly farm land until the 1980's when they started building large single family home and townhome subdivisions. 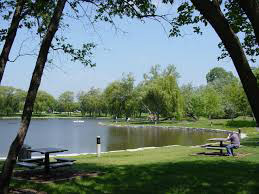 Schaumburg is a popular place for Chicago loft and Chicago condo young couples starting families to move to as it has the convenience of shopping and activities and convenience to highways to the airports and city.